I was born in Wembley, which is in North London, in 1959 and lived all my life in Wembley until I became an Ahmadi Muslim. I have two brothers and no sisters. My eldest brother, who is unfortunately mentally handicapped, lives in a mental home and my other brother now lives in Buckinghamshire. My parents, when I went to Pakistan, moved to Sleaford, in Lincoln. But now they have both passed away. I was the youngest in my family. 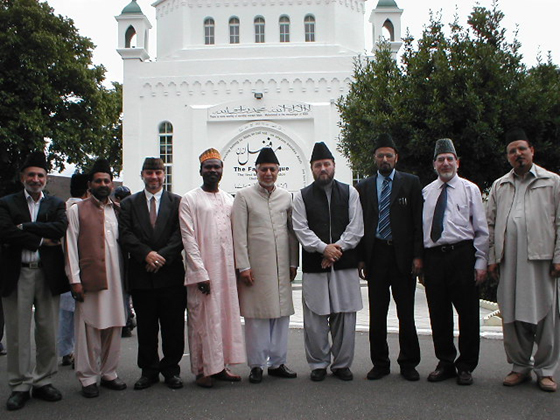 Maulana Ibrahim Noonan and Maulana Tahir Selby with the other UK Missionaries in 2006. As a child, I was raised in the Church of England, but I wasn’t very religious, although I used to go to church for Sunday School. I was also in the church choir, although I couldn’t sing; I went to the church club and I was also in the cub scouts and then the sea scouts, which were all on the church grounds. I therefore used to spend a lot of time in the church grounds, but not really for religious purposes. As I was growing up, I didn’t reject God, but I didn’t really worry about God either. I thought that, I’ll worry about God when I am about to die, but now is the time for living. So if you spoke to someone about me who knew me when I was young, they would never believe that I would have become religious, let alone be a religious leader, because my lifestyle and my attitude was so irreligious. My family wasn’t really that religious, although my stepfather was a Catholic. Religion didn’t really play a part in our family. Actually what happened was that, one-day, in the group that I was with there was one Muslim among them and we started talking. It was really just idle talk between us, as I had no interest in religion. So I started asking ‘why do you have arrange marriages and why don’t Asians mix with English people?’. I wasn’t really interested in the answers, I was just making idle talk. But that person instead of answering me, gave me the book ‘Philosophy of the teachings of Islam’ by Hazrat Mirza Ghulam Ahmad. The last thing I ever wanted was a book on religion, especially on Islam. I didn’t really like to read books and I especially wasn’t interested in religion. But I didn’t want to upset that person. So I felt that if I read the first page and the last page and return the book and say ‘yes it was a really good book’, then I could move on. But what happened was that I started reading the first few pages of the book. For those who haven’t read the book it begins by explaining the three stages of man and the first stage is the lowest, which is of an animal. He just eats and drinks and does things by instinct. There’s no real motive behind what he does. Unfortunately I felt that I was at that stage, I just followed my passions, and of course that hurt! No one wants to read that they’re ‘an animal’. So this made me want to read more of this book. The problem was that it was a very deep book. It was a book, which you had to read over and over again to grasp it’s true meaning. Although I wanted to read more, but I felt that my eyes were getting tired very quickly and after a few pages I had to put it down. I had the intention of reading it again the next day, but then I’ll just get lost in the world again. It was only when I didn’t have anything else to do, I used to pick up to the book and start reading it and start enjoying the book again. But the same thing used to happen over and over again, my eyes would get tired, I put it down with the intention of reading more the next day, but would get caught up in the world again. This carried on for months. It took me a long time to complete the book, maybe three to four months, but once I had completed it, suddenly an interest had grown. I felt that my moral behaviour needed to change. My understanding about God and religion also changed and now I started to understand what was the real purpose behind religion, that it was not something to restrict you; but to guide you, to help you become a better person, to help you develop your relationship with God. That’s when I wanted to know more about religion. What the real purpose of religion was. So I went back to the person who had given me the book and asked for more literature. I started to read more and more books and I especially enjoyed reading about the life of the Holy Prophet may peace and blessings of Allah be upon him and the Holy Qur’an. I had a small pocket size book with English translation. One thing that kept pricking my mind was when I use to read ‘do not follow your forefathers’. This gave me encouragement that I could read more about Islam. But reading the Holy Qur’an also gave me a guilty conscience and I wanted desperately to change myself and please my God. But I knew I needed to win His Forgiveness and strive to win His love, so I set about changing myself and my ways and strove to win His Pleasure. One time I asked my friend, ‘how to pray’ I don’t really know what I was expecting, but I was shocked to be given the ‘Muslim Salat Book’ and discovered that there were certain positions and words that I needed to say. But I started to say these prayers in English and did as many prayers as I could find time to do. Eventually, the month of Ramadhan came and I decided that I wanted to try fasting. It seemed like a good idea and I wanted to see if I could do it. I found it very easy. I enjoyed fasting. I tried fasting because I wanted to try a new experience; I was into new experiences at that time. The first week I found really easy and I was sure that I could do the whole month. I had a lot of pressure from my mother saying that I was losing weight and I was ‘disappearing’ and she was begging me to stop. So I decided to stop for one week. But then I started again and done it for another week and again the same pressure came from my mother. So I stopped for the fourth week. Another problem I was having was that I was constantly being told to ‘put God first’ and I kept asking myself ‘how can you put a spiritual being before my physical family and friends?’ I kept asking myself ‘how do I achieve this?’ But these were fatal words for me because after this I went through a series of trials. My grandmother passed away, my aunty passed away, my real father passed away and I crashed my car. Every time something like this happened, I felt it was a trial from God that ‘you put these things before Me and now I have taken them away. What are you going to do now?’ Fortunately every time I would return to God to seek comfort and because of this I would get closer to God every time. The following year, Ramadhan returned and I did the same pattern – I fasted for one week and the next week I would stop, etc. With regards to the issue of putting God first this was still a problem for me because at the time I still had a girlfriend and no matter how much I loved God, the girlfriend was always going to be first. After a while we broke up and that was the last barrier, which was holding me back. After about three years the only thing left to do was to go to the Mosque. But there was still this thought on my mind that this religion was not for people of the west. I mentioned this to a few friends and they said ‘we will come with you’, but I felt that this was something I wanted to do on my own. But after a while it became a big issue. By this time I was a practicing Muslim, doing everything that God wanted from me and I had learned to put God first. It was only this last thing holding me back from feeling like a ‘’Proper Muslim’’ that I wasn’t going to the Mosque. Of course when I started to look into Islam, like everyone else, I thought that Islam was ‘one’ and there were no sects in Islam and when I learnt that this was not the case, then I felt that I didn’t want to get involved in any groups either. As far as I was concerned I wanted to be a good Muslim and to follow the Holy Qur’an to the best of my ability. But the more and more I read about Islam the more and more I understood the importance of the Promised Messiah. Whilst the Second Coming of Jesus was never an issue for me because personally I never believed he was going to come back. But the more I read the more I started to enjoy the explanations of the Promised Messiah’s writings and I thought to myself ‘if I am going to join a sect it would most likely be this one (Ahmadiyyat)’ although I would try not to associate myself to any particular sect in general. But after a time I started to regard myself as an Ahmadi Muslim. One time my brother worked at the Iranian Embassy and when they got to hear that his brother was a Muslim, they were very pleased and treated him more respectfully. But when they heard that I was an Ahmadi Muslim, suddenly he was given many books to give to me to ‘guide me back to the right path’. By now, I felt I had to go to a Mosque, but it would have to be an Ahmadi Mosque. During my third Ramadhan I was determined I was going to fast throughout the whole Ramadhan and by the grace of God I achieved that goal. I also wanted to go to a Mosque, but unfortunately I couldn’t achieve that. I remember that I would use any excuse or reason not to go to the Mosque. The whole month of Ramadhan passed and still I hadn’t been to the Mosque. So I decided that I would take a day of from work and go to the Mosque to pray Eid prayer. In those days money was still quite important to me. So now that I had taken a day off from work there was no excuse, because I was losing a days’ worth of pay, so I had to go to the Mosque. This gave me the push to go to the Mosque. At the time I was living in Wembley, so I drove to the Southfields Mosque (Fazl Mosque) and parked right in front of the gate. This was in 1983, before Huzoor had come to England. I saw a family walking into the Mosque and followed behind them, to make it seem as I was with them (I still was very unsure as to what sort of reaction I was going to get, being white). They walked directly into the London Mosque and I also followed them in and waited for the Eid prayer to commence. Suddenly I heard the Imam repeating ‘Allah-u-Akbar’ over and over again (seven Takbirs), so I thought to myself that I had been doing the prayers wrong. But then I remembered that in the Eid prayer there was meant to be something different. Sheikh Mubarak Sahib was the Imam of the mosque at the time and he delivered the sermon in English and then after his sermon everybody got up and started to embrace each other. I got really worried that what kind of group have I got myself into; they have all started to cuddle each other! Then someone put his hand on my shoulder, which made me jump. They introduced themselves as Mr Nadeem Malik, Mr Nadeem Vandaman and Mr Mubashir Gulzar and I asked them ‘what is this, why is everybody embracing each other?’ They explained that it was because of the joy of the day and it was a way of expressing it. Then they introduced me to Sheikh Mubarak Sahib. I remember seeing so many people when I stepped out of the Mosque and thinking to myself ‘where did all these people come from? they couldn’t fit in the Mosque.’ I didn’t know about Mahmood Hall and the marquee. They bombarded me with a ton of books. I remember going back to Mr Nadeem Malik’s house and also meeting Muzaffar Clarke Sahib who lives in Birmingham. He was also studying about Ahmadiyyat in those days. That was a great day! Then they started to invite me more often and I started to go to the mosque more frequently. So I regarded myself as an Ahmadi Muslim. One day I was at Nadeem Malik sahib’s house with Muzaffar Clarke sahib when he informed me he had just done the Bai’at. I asked him what’s a Bai’at ? He replied that this is an initiation form to join the Jama’at. So I told Nadeem ‘to bring me one straightaway!’ But Nadeem Sahib told me to think about it. I informed him that I was already considering myself to be an Ahmadi and so I did not see the point of waiting any longer. If I knew I had to fill in a Bai’at form I would have done it sooner. He bought the form and I read the Ten Conditions of Bai’at. I told him ‘I can’t sign this.’ He asked me what the matter was. I told him that I had a problem with condition number 10, that I can’t unconditionally obey the Khalifa, because history shows that in the past, the Khulafa have become corrupt and that I could not obey this Khalifa if he became corrupt. To this he explained that we Ahmadi Muslims believe in the one God and we also believe that the Khalifa is from God and if, God forbid, he does become corrupt then God would take him away and the second thing was that God tells us to ‘only obey what is right’ so even if he told us to do something wrong, then as Muslims it is our duty not to do that certain thing which is bad. After hearing this explanation, my concerns were removed, I no longer had a problem so I signed the form. This became a major issue with my mother, who I suppose was hoping that this was just a passing fad, but now changing my name, meant that it was serious. She objected to me changing my name and refused to call me by my Muslim name. Which was fine and understandable, but to my friends I insisted they call me by my Muslim name. In fact, at work, I wore a label and told everyone they can call me what they like, but if they want me to respond, then they should call me ‘Tahir’. Another turning point in my life came about when I decided to dedicate my life for God and become a Missionary. This is again one of those things that when you look back at, you realise how God has helped you in so many ways! By the time when I had converted I already had a firm relationship with God because I had learned how to put God in front of everything else in my life. And also because I had started to go to the Mosque regularly I now had access to all my Muslim brothers and all the literature I could have asked for! At that time I used to go to the Southall Mosque quite regularly. In the Southall Mosque there was a person called Hamid Sahib of Slough who I used to sit with and have conversations about all sorts of things, but one topic that we spoke about the most was Jalsa Salana. He used to tell me that I have to go to the Jalsa Salana to experience it for myself. But because that year I had been on holidays a few times I told him that I just couldn’t afford it. But I still enjoyed listening about the Jalsa. My father had passed away a year previous and he had a work pension that no one knew about and a solicitor came and gave us the money, which no one was expecting. I thought to myself that it was a shame that I had not received this money earlier. If so, I could have gone to the Jalsa in Pakistan. But luckily for me, a lot of the Jama’at friends in Southall worked for British Airways and they told me that it was not a problem and if I still wanted to go to Pakistan and attend the Jalsa, they would try to sort something out for me. 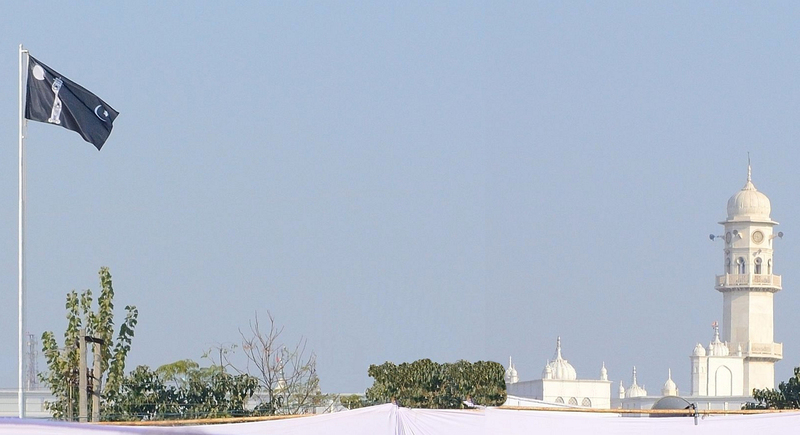 This was very late, I had missed the Qadian Jalsa, which had only just taken place a week before the Pakistan Jalsa. I just got there a couple of days before the Pakistan Jalsa. This was in 1983. By the grace of Allah this was a wonderful Jalsa and there were over 250,000 people who had attended that year. Whilst I was there I was introduced to some Jamia students who were from Africa and some other countries. So I started to talk to them about Jamia. I knew a little about Jamia from before but not much. Now that I started meeting these students, I started to gather information about Jamia from them because at that time my only real enjoyment was religion! I worked, but that was only to get a means for living. I didn’t really have true job satisfaction. Another thing was or is that when you come into this Jama’at, everybody is really motivated to improve themselves and mankind. At that time I felt like I wanted to do more and I wanted to improve myself for the better and felt that my job was a dead end job. I really started to think that how can I help mankind. I started to ask myself whether I should change my job. So now, after hearing about Jamia and sacrificing one’s life purely for the pleasure of Allah, this really took a hold on me. I started to gather as much information I could about Jamia. I spoke to Nasir Ward Sahib, one of the English delegates, and he told me that he would have loved to become a missionary but he was married at the time, which made it hard for him. Because at that time I was free, I also wanted to change job and I wasn’t married either, so I didn’t have any commitments as such. And it also felt the perfect time for me. I decided not to make any decisions there and then; instead I went back home and thought I will speak to my parents and friends. Everyone was very encouraging, saying that if this is what I really want to do, then I should do it. My family advised me not to speak to my mother yet, as I told them that I didn’t think I wouldn’t be accepted. My reasoning was that at the time I was only 3-4 months into the Jama’at. I wasn’t well educated and I was also at the age of 24 and usually you tend to go to Jamia at the age of 16. This is the way that Allah works because that was in 1983 and after that Jalsa Salana, there has never been another Jalsa in Pakistan since. If I had never gone to Pakistan Jalsa, I would have never considered this career of lifestyle as an option. I could have changed my job, got married, but fortunately Allah had different plans for me and suddenly I had the money to go to Pakistan and I met with the Jamia students. So I strongly believe that this was all from God! I was fortunate to have a Mulakaat with Huzoor. Actually when it came to my time for the Mulakaat, it was the time for prayers, so I was told to come back after prayers. As the Mulakaat time had finished, Hazrat Mirza Tahir Ahmad, the fourth Khalifa, gave me a long time with him. 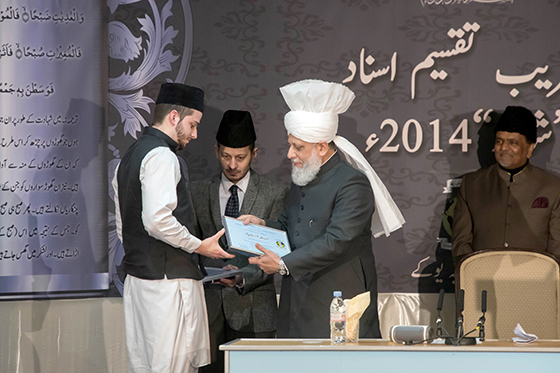 He told me to motivate the youth and I thought to myself, ‘how am I going to do this?’ When I got back to England I spoke to my friend Tariq Suliman (I went with his father to Pakistan), a local Khadim and he started to take me around to meet up with the Khuddam who were at that time inactive. When I started doing this I realized that there was a link between all these Khuddam and that link went back to the Atfal. They all knew each other from the Atfal classes. This is when I realized the importance of the Atfal classes. So once I met all the Khuddam and I told them that we would have football matches and meetings and this made them eager to start. Through this we were able to motivate the youth, so much that when I sent a letter to Huzoor requesting to dedicate my life, they asked the missionary of the Southall Jama’at to send a report regarding how I was doing, he replied by saying that I was already doing missionary work. Alhamdulillah, they accepted my application and told me to go to Pakistan in September 1984. Of course, then our beloved Huzoor came and settled in English in April and I had the opportunity to attend his Majlis Irfans and do security duties at the London Mosque. I started Jamia in September 1984. My experience in Jamia was wonderful. I used to say to my friends that if you could stay in Rabwah you could stay anywhere in the world. 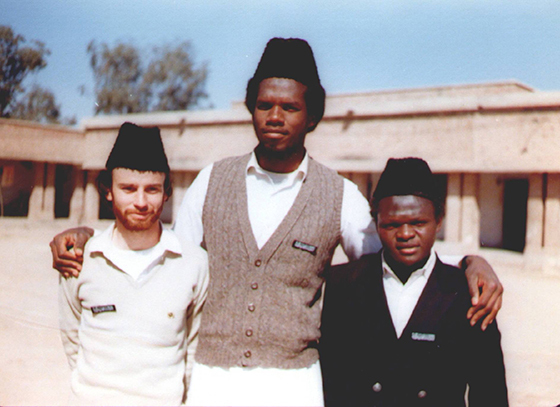 Initially when I went to Rabwah they put me in Dar-ul-Ziafat. But I didn’t want to be treated like anyone special, so I asked whether I could be moved to the Jamia Hostel. Everything changed dramatically after I moved to the Hostel, especially the food, it was then that I wished that I had stayed in Dar-ul-Ziafat! I remember the weather was very difficult because when it was hot, it was really hot and when it rained, it rained very heavily. Everything was to the extreme. I still remember that in the first year that I moved to Jamia, Ramadhan was in the month of June or July, which are probably the hottest months in Pakistan. I remember some students raising concerns for me and saying that I didn’t need to fast because I was a student. But I thought to myself ‘that’s nonsense I am definitely going to fast.’ I also told them that not only am I going to fast but I am also wanting to sit Itika’af (I was fortunate to sit Itika’af at the London Mosque, soon after Huzoor had arrived). During that month of fasting, we also had many exams to take. I was doing the Mubashir Course in English Medium along with Maulana Azhar Haneef of USA and Maulana Abu Bakr of Tanzania. We had to take about twelve to sixteen exams in a period of twenty or so days. Because I was sitting Itika’af, I got some of my exams moved forward. I remember I would be sitting in my cubical with a bucket of water and I would pour a cup of water on my head whilst studying for my exams, because the floor was of concrete, the water would just dry out after a while. That was how I tried to keep myself cool. The time I had in Pakistan Jamia was amazing! The people of Rabwah were very friendly and looked after me. I was very fortunate to have other foreign students over there as well (there was 73 foreign students from 23 different countries), which was good for me because I didn’t really feel left out then. When I neared the end of Jamia, I felt that it was important to get married and by the Grace of Allah, I had an arranged marriage to another English convert. After I passed out from Jamia and returned to England, I got married within a month and the first place we were sent to was the Southall Mosque, and I was doing work experience with Imam Sahib in London, whilst my wife helped with Huzoor’s correspondences. We travelled everyday on the train and then returned to Southall. We were then sent to Scotland for about a month to gain some field experience with Maulana Naseem Bajwa. Then when we returned to London I was posted to Bradford in March 1989. This was the first place I was officially posted as a missionary. In Bradford I was looking after the North East Region. Occasionally I would also look after the North West and South Yorkshire. But mainly I was posted to North East and I was there for about ten years. Then I was posted to Scotland and I spent about two years in Scotland. After that I was posted to the Midlands and I spent about eight years in Midlands and now I am serving as a Missionary in Hartlepool Jama’at and serving the North East Region once again. 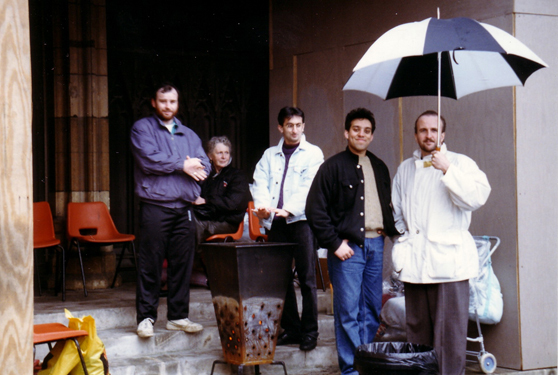 From left: Maulana Tahir Selby, a lady?, Waseem Ahmad, Faran Chaudhry and Nom’an Newman.